Our boat is pretty dirty. We bought it that way. And although we will have it out of the water in a couple weeks for a marathon weekend of work (and the occasional refreshing beer), we wanted to get a head‑start on the cleaning. The deck was so dirty and the pressure washer was so effective that the cleaning process actually appeared more like applying a fresh coat of white paint. 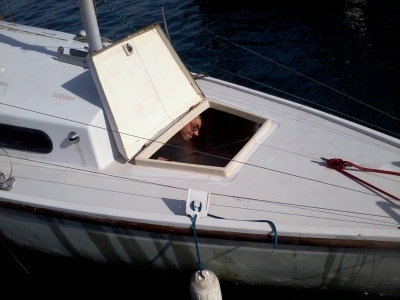 At one point Manuel remarked “There’s actually boat under there!” It was also an incredibly effective sander, peeling away layers of green growth from the few pieces of wood Kyle and Manuel hadn’t detached for revitalisation at home. But why stop there? 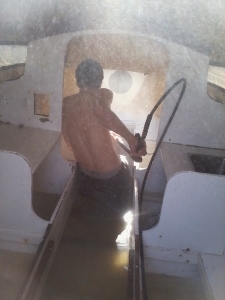 The inside had been stripped of everything so I ventured below deck with the magic diesel-powered wand, cleaving mould and grime and paint from the bits of the boat we want to keep. This is a rather wet process that I imagine resembles a child with an overpowered water gun stuck in a fridge trying to kill the boogeyman with his eyes closed. Manuel was jealous of the fun and wanted a go. He also wanted to borrow my rain pants but I couldn’t just give him them because they were all I was wearing. Naturally we decided to swap pants, but smartly waited until the teenage sailing lesson on the dock next to us finished rigging their boats and were busy tacking away. Sorry about your phone! that crazy german, what you going to do with him?